There are 13 countries where atheists receive capital punishment. In some countries, the declaration of atheism can lead to punishment as extreme as the death penalty. Atheism can be defined as the absence or rejection of belief in the existence of deities. Individuals with atheistic principles are known as the atheists. The term atheism was first used in the 16th-century. The first individuals to identify themselves as atheists lived during the Age of Enlightenment in the 18th-century. Atheism became popular during the French Revolution which was the first time the concept of atheism was implemented politically. There is a popular belief in the present times that the number of atheists is growing across the world. However, since the conception of atheism varies, estimation of the exact population of atheists becomes a complicated task. In 2015, a survey by WIN/Gallup International reported that 11% of the global population are atheists. A previous survey by the BBC in 2004 estimated that atheists account for only 8% of the world population. Where Is Atheism More Common? 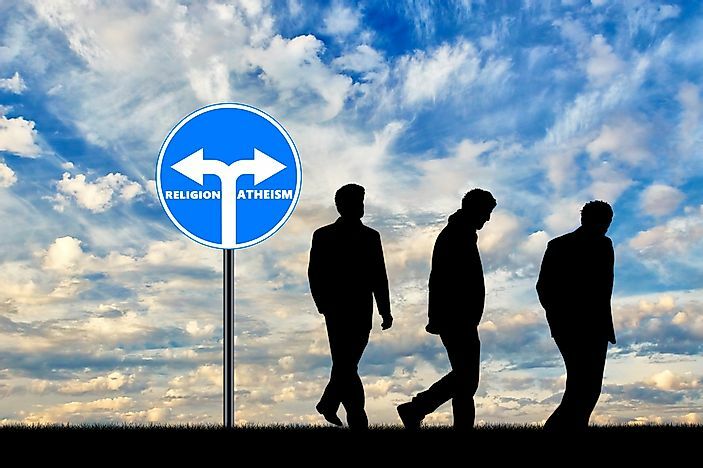 According to studies, atheism is more common in the economically developed world where people enjoy prosperity, social security, high life expectancies, and an overall high standard of living. Thus, atheism is more common in Europe than in any other part of the world. A 2010 Eurobarometer survey estimated that 20% of the population of the EU did not believe in any form of God. On the other hand, countries that are least developed have a higher percentage of believers in the population. Atheism is also common in the Communist-ruled nations like China. 61% of the Chinese population claimed to be atheists in a 2015 survey. Although one can claim to be an atheist in most European countries without any repercussions on his or her way of life, freedom, and security, there are 13 countries in the world where being an atheist can invite death. Nine Asian countries, namely Afghanistan, Iran, Yemen, United Arab Emirates, Maldives, Pakistan, Saudi Arabia, Malaysia, and Qatar impose the death penalty on residents who claim to be atheists. The African nations of Mauritania, Somalia, Sudan, and Nigeria are the remaining four countries that also use capital punishment to discourage atheism in the country. It is interesting to note that all these 13 nations are Muslim majority countries. Although atheists in the above-mentioned countries face the risk of being killed, there are many other countries where atheists are subjected to heavy discrimination and other forms of punishments. They are often socially outcasted in such societies or are even murdered. For example, atheist bloggers in Bangladesh were hacked to death in recent times for writing posts related to their atheistic beliefs.